Has my Plan changed or not? We have learned from Kerry Osborne’s recent post on SQL Gone Bad – But Plan Not Changed?, and a prior post from Randolf Geist on PLAN_HASH_VALUE – How equal (and stable?) are your execution plans – part 1, that having the same Plan Hash Value (PHV) it is not guarantee that we actually have the same Execution Plan if you were to consider Access and Filter Predicates for Plan Operations. So, what does it mean? It means that if you have inconsistent performance out of the same Execution Plan (same PHV) it is not enough to just check if you have or not the same PHV. You need to be aware of the Predicates as well. Of course there are other possible explanations for having inconsistent performance out of the same PHV, like skewed data combined with the use of binds, but that is another story. The opposite to “Same PHV but different Plan” is also possible. So, after we understood we can have the same PHV but not quite the same Plan if we include in the compare the Predicates, the question became: Can we also have cases having the same Plan (including Predicates) but get a different PHV? And the answer is YES. Discard the keyword STORAGE, which we can consider not strong enough to determine a Plan Operation is different. Of course this is questionable, but as of today the PHV is blind to the STORAGE keyword, so a Plan with or without this keyword would render the same PHV. What about system-generated names like ‘SYS_TEMP%’, ‘index$_join$_%’ and ‘VW_ST%’? In all these 3 cases the PHV will be different but the Plan is actually the same, with the exception of the system-generated names. So, if you just look at the PHV and see that is different then it is also possible that actually you have the same Plan. What if in the case of having the same index name, the set of columns or their order is different? In these cases you may look at the PHV and see the same value, and indeed it is the same Plan, but if the columns on a referenced index have changed, is it really the same Plan? In my opinion it is not! You could be spinning on an issue where you have same Plan, different Performance, but an Index changed its columns. Since we have the two cases: “Same PHV but different Plan” and “Same Plan but different PHV”, reviewing and ruling out these two possible cases on a complex Execution Plan can be cumbersome and time consuming. That is WHY SQLT incorporated the concept of SQLT Plan Hash Value (SQLT_PHV) since version 11.4.0.5 (from May 20, 2010). First came SQLT_PHV1, then SQLT_PHV2 (on SQLT 11.4.2.4 on February 18, 2011). So we have now PHV, SQLT_PHV1 and SQLT_PHV2, as you can see below. When it comes to Execution Plans and their Plan Hash Value, it is possible that two Plans with same PHV are actually different if you consider the Predicates, and also possible you get a different PHV even if the Plan is the same if your Plan has system-generated names. So, during your analysis just looking at the PHV to determine if two Plans are the same or not is not enough. 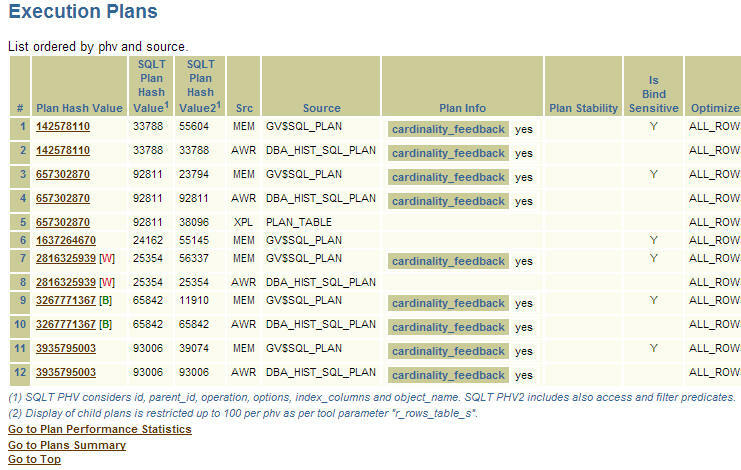 If you are already using SQLT, pay attention to the “Execution Plans” section, and to the SQLT PHV1 and PHV2 columns. SQLTXPLAIN is easy to install. Yes, unless you hit a rock! So, if you are trying to install SQLT and you do not see the message that reads “SQCREATE completed. Installation completed successfully.” then something went bad. First, you have to identify if the reason was captured by SQLT or not. In other words, if it was captured by SQLT you will see in your screen that your session ended normally. If it was not trapped by SQLT you will see an error like ORA-07445 or ORA-03113 and a statement that says something like “end-of-file on communication channel”. In such case SQLT could not trap the error. In any case, once you locate the error it is just a matter of taking a corrective action and re-installing SQLT. But if you see a package body has errors but the error is not displayed in any of the log file (specially on the one with name like 130515065531_08_sqcpkg.log) then you may need to do this: unlock and reset pwd for SQLTXADMIN then try an alter package compile connected as SQLTXADMIN. Once you see the error then you can fix it. This kind of problem is a bit more complicated. If you see an ORA-07445 or ORA-03113 or “end-of-file on communication channel” then it means SQLT could not trap the error and you have to look for it inside the alert log. It also means that your problem is not derived from SQLT, but SQLT is simply a victim of it. You may find more information in your alert log, and you will see references to some traces. Look for those traces and review the upper part of those files. They should show a stack of calls and some keywords associated to your error. You can either research for those keywords on your own, or report to Oracle the errors you see in the alert log. Again, at this point the problem is not SQLT but something else in your server code that happens to affect SQLT. Since the skills to diagnose a server problem are not the same as those needed to diagnose a SQLT installation issue, be sure to document clearly what is the problem you see. This type of disconnect is a server problem, the former is a SQLT problem. I do not have a typical list for this type since possibilities are many. You may find an ORA-00600 or something else. What I have seen recently are problems around the use of NATIVE for plsql_code_type. This change was introduced a few SQLT versions back and some customers have reported installation issues. If you see on your errors something that suggests PLSQL, then you may want to modify line 29 of the sqlt/install/sqcommon1.sql script, removing the “–” at the beginning of this line: DEF plsql_code_type = ‘INTERPRETED’;. In other words, un-comment this command. Then re-install SQLT. This action would reverse the use of plsql_code_type to less efficient INTERPRETED mode, but may workaround your plsql error. If you are the requester mentioned above, or there is no one else to go, then look in the sqlt/sqlt_instructions.html file for the primary and secondary contacts for this tool (documented starting on version 11.4.5.9 of the tool). SQLT installs with no issues most of the times, but if it fails to install in a particular system, you are not on your own. Do your best to find the root cause, then ask for help if needed. Be prepared to provide any log file created in your local SQL*Plus directory PLUS the SQLT archived logs; and in cases of disconnects collect also the alert log and the traces referenced directly by the corresponding error on the alert. A question that I often get is: How do I move this good plan from system A into system B? To me, this translates into: How do I migrate an Execution Plan? And if source and target systems are 11g, the answer is: Use SQL Plan Management (SPM). Assuming both – source and target systems are on 11g then I suggest one of the two approaches below. If the source is 10g and target is 11g, then the 2nd approach below would work. In both cases the objective is to create a SQL Plan Baseline (SPB) into the target system out of a known plan from the source system. How SQLTXPLAIN (SQLT) can help? Options 1 and 2 above list the steps to take a plan from a source system and implement with it a SPB into a target system. The questions is: How exactly do I perform each of the steps? Yes, there are APIs for each step, but some are a bit difficult to use. That is WHY I have created a set of scripts that pretty much facilitate each of the steps. No magic here, only some time savings. If you want to use these scripts, look for SQLT directory sqlt/utl/spm, which will be available with SQLT 11.4.5.8 on May 10, 2013. If you need these scripts before May 10, then please send me an email or post a comment here. If you have a poorly-performing SQL statement on a read-only standby Data Guard database, now you can analyze it with SQLT. Just need to install SQLT on Primary, create a database link into the read-only and use new method SQLT XTRSBY passing SQL_ID and db link name. Read sqlt/sqlt_instructions.html for more details. In addition, there are two stand-alone scripts (with no SQLT dependencies) that you can use directly on any read-only database. They are sqlt/utl/roxtract.sql and sqlt/utl/roxecute.sql. They mimic SQLT XTRACT and XECUTE but in a smaller scale. Notice that you can also use these two stand-alone scripts safely on any production environment since they do not execute any DDL and they perform queries only (no inserts, updates or deletes). What do you get from them? You get the basics: execution plans; peeked binds; CBO statistics for Tables, Table Columns, Indexes and Index Columns; SQL Monitor Active report; 10053 trace; 10046 trace and TKPROF on roxecute.sql. If using SQLT XTRSBY on a Data Guard Primary database, you may also want to use roxtract.sql on the read-only standby database. Combined you will get more about your SQL. XTRSBY focuses on GV$* from standby plus DBA* from Primary. Script roxtract.sql only looks at standby. As always, download latest version of SQLT from MOS 215187.1. Removed annoying message on main “sqlt$a: *** t:plan_operation%: ORA-01403: no data found”. Test Case (TC) script q.sql now takes values of NULL on binds instead of continue searching for not NULL values. It also handles string “NULL” as NULL on dba_hist_sqlbind. SQLT is now Data Guard aware. There is a new method SQLT XTRSBY which is executed on Primary and extracts from stand-by almost everything XTRACT does. Please refer to instructions before using this new method. In addition to new SQLT XTRSBY which runs in Data Guard Primary, there are two new scripts sqlt/utl/roxtract.sql and sqlt/utl/roxecute.sql which are super lite versions of SQLT XTRACT and XECUTE. The new read-only (RO) scripts can be used on any read-only database since they do not install anything and do not update anything. They provide a quick and safe view of the environment around one SQL statement. New instrumentation on SQLT XTRACT, XECUTE, XTRXEC, XTRSBY and XPLAIN. All these methods produce now a TKPROF for the actual execution of the tool. The new TKPROF is located in the log zip file. It helps to diagnose SQLT taking longer than expected. Skip MDSYS objects from metadata script. Since MDSYS is part of the data dictionary, it makes sense to skip it from Metadata as we do with similar schemas. Column remap on SQLT TC now considers map by QUALIFIED_COL_NAME when name is other than SYS%. This helps to match more columns when we are restoring CBO schema statistics while remapping to new TC user. Metadata includes now PL/SQL library which executed the SQL being analyzed. This is useful to actually see the piece of program that invoked the SQL being analyzed.